Yusto Awich successfully completed the Building Trades program at New Community Career and Technical Institute in 2017 and now owns his own construction business. Students of New Community Career and Technical Institute (NCCTI) earn certifications in their field of study and are well prepared for jobs after graduation. While many graduates obtain employment from others, some branch out on their own. Yusto Awich is one of those students. He completed the Building Trades Specialist program in 2017 and today he owns and operates his own general construction business. Awich owns Pafya General Construction in Newark, which he started last August. He always knew he wanted to open his own business and enjoyed the building trades and construction industry. This is a second career for Awich, who served as a New York City school teacher for about 10 years, teaching biology and sciences. He took an early retirement and decided to pursue a building trades career. Awich lived in Newark and saw that New Community had an accredited school. He also heard about the institution through the New Jersey Department of Labor and Workforce Development, which he became involved in after his early retirement from teaching. He is happy he signed up for classes at NCCTI. NCCTI Director Rodney Brutton said the goal is to prepare students for successful careers, whether it’s being an employee or a business owner. Awich also liked the fact that the class size was small. “You get the full attention of your instructor and everything that is happening, every topic that is discussed,” he said. 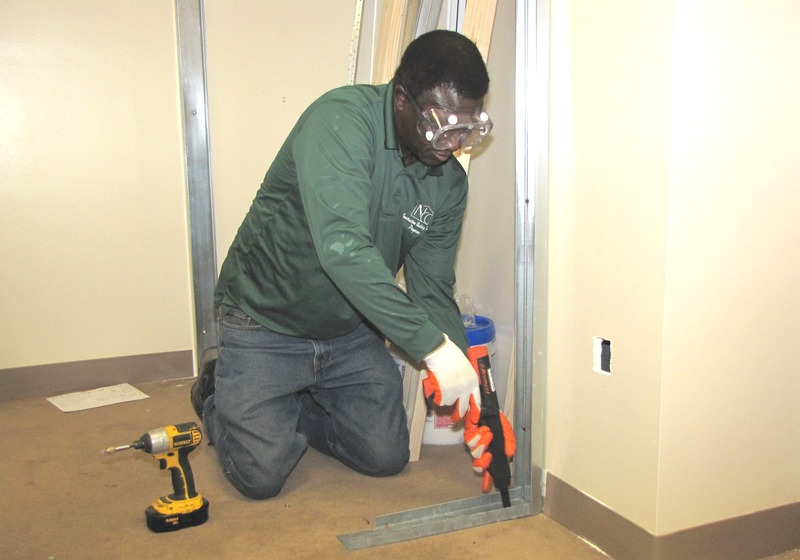 William Robinson serves as the Building Trades instructor for NCCTI. Awich said he was very knowledgeable and helpful. Robinson said Awich was a very good student who helped his peers if they found the work challenging. To help him launch his business, Awich attended several small business classes. There he learned the process and registered Pafya General Construction with the state of New Jersey. Pafya General Construction offers construction services that include painting, framing, electrical, flooring, tiling and plumbing. Awich mainly works in residential buildings and also does bathroom renovations and kitchen cabinet installations. He does much of the work himself and hires people to help with jobs when necessary, including NCCTI students on occasion. Right now, Awich said he gets jobs through word of mouth from clients. He currently works with a company that owns 56 homes that calls him when work is needed. He said it’s good experience because he is able to work and he can use the company as a reference for future prospective clients. While Awich also worked in maintenance for another company, he said his training from NCCTI really helped him launch his business. Brutton said entrepreneurship is a career path for students in the Automotive Technician, Building Trades Specialist and Culinary Arts Specialist programs that NCCTI encourages. “Yusto was able to take advantage of all of the services provided through the career and technical institute and utilized these resources to create his own business,” Brutton said. Pafya General Construction can be reached at 718-844-0305. NCCTI is an accredited post-secondary career and technical school that offers the following programs: Automotive Technician, Diesel Technician, Building Trades Specialist, Clinical Medical Assistant, Patient Care Technician, Culinary Arts Specialist and Business and Computer Technologies. Those interested in enrolling should call 973-824-6484 or visit www.newcommunity.org. The school is located at 274 South Orange Ave., Newark, with the Training Center that houses Automotive, Diesel and Building Trades programs located at 210 West Bigelow St., Newark.